Reservations must be paid no later than 20 minutes prior to the beginning of the lesson otherwise the reservation expires without any compensation. Upon the payment of the lesson(s), the client will receive proof of payment and a Skischool Lipno Customer Pass. The Skischool pass is non-transferable. At the end of the first lesson the client must submit the bottom part of their pass to the instructor. Clients retain the top part for possible future inspection. Clients are required to have their pass on them throughout their tuition otherwise they will not be admitted to the lesson. Clients are only entitled to participate in those lessons whose times and parameters are laid down in their passes. Any changes to the times or the form of tuition may only be arranged in the offices of Skischool Lipno. Any loss of the pass must be immediately reported by the client at the offices of Skischool Lipno. A duplicate of the pass will be issued to the client upon the presentation of their proof of payment. Where Skischool Lipno is unable, for capacity reasons, to fulfil all the requirements for private lessons, it reserves the right to offer the client the same lessons at any other time, or group lessons. The group lessons only take place when there are at least 5 clients in the group. 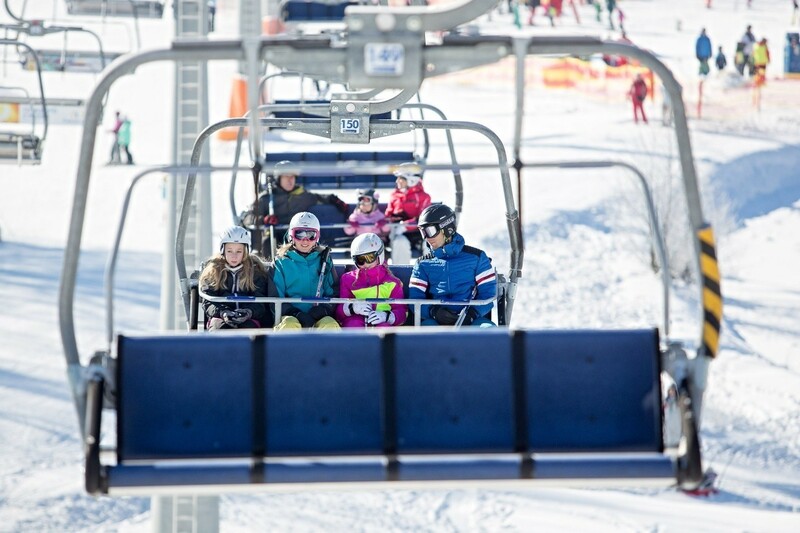 If the group is not full, Skischool Lipno may offer the client an alternative time for the lessons or private lessons. When the group lessons are prolonged, the price will be calculated as the difference between the price of the new course and the original one. Skischool Lipno does not guarantee the same ski instructor throughout the lessons. 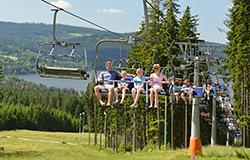 During the lessons all clients of Skischool Lipno have free access to the Foxpark and the Skischool Lipno Park. The price for private and family lessons includes a ski pass which is valid for the period of tuition. The ski pass does not apply to evening lessons. For group lessons the client is required to purchase a ski pass. Unused services will only be refunded in cases where the client is taken ill or suffers an injury and then only upon the submission of a valid doctor’s note. Refunds can not be claimed when lessons are hampered by poor weather conditions or the limited operation of transport facilities. Where the client fails to present themselves on time, or at the latest 10 minutes after the start of the lesson, they may not be admitted to the lesson if it is deemed to disturb the course and methodology of the lesson. The client or their legal representative is responsible for wearing suitable clothing and equipment and for their state of health. If the client behaves inappropriately during the lesson, they will be expelled from the lesson without any compensation. Skischool Lipno is not liable for damages caused to the client by a third party or caused as a result of negligence. Payment of the fee for the Skischool Lipno course is deemed to be the client’s consent to the terms and conditions of Skischool Lipno. Clients seeking a specific instructor are required to pay a 10% surcharge for this additional service. For safety reasons all participants in the lessons are required to wear a special vest or a distinguishing armband. Children under 15 years of age must wear a special Skischool Lipno vest. The vests are available at the Skischool Lipno ticket office. Clients are required to pay a deposit of CZK 300 per vest. The deposit is refunded upon the return of the undamaged vest. For safety reasons only Skischool Lipno vests may be worn during the skiing lessons. Clients who wear any other vest will not be admitted to the lesson. The return of the deposit for the vest and eventual refund for unused tuition will always be carried out in the same way as the original payment. If the payment was made using a payment card, the refund will be made to the payment card. Under such circumstances cash refunds cannot be demanded. Cancellation of 1 lesson if the lesson is cancelled prior to expiry of 50 % of the lesson duration (a single lesson – 25 minutes / a double lesson – 50 minutes). The price for other lessons unused is returned in full. Cancellation of 1 lesson if the lesson is cancelled after expiry of 50% of the lesson’s duration (a single lesson – 25 minutes / a double lesson – 50 minutes). The price for other lessons unused is returned in full. These Rules are valid as of 1st December 2016. Customers of the hire shop understand that the hire shop keeper can make pictures of customers or visual and audio records capturing customers at the occasion of various events. Customers give their consent to making of such pictures or visual and audio records (hereinafter referred to as the “Record”) free of charge and agree that the hire shop keeper can publish the Records having been made (e.g. pictures) depicting customers to promote its activities exclusively at the following websites: www.lipnoservis.cz www.skiareallipno.cz, zima. 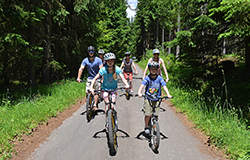 lipnoservis.cz, www.lipno.info, www.activeparklipno.cz, www.lipnoservis. 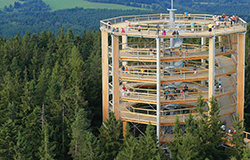 cz, www.stezkakorunamistromu.cz, www.campinglipno.cz as well as on facebook profiles of Skiareál Lipno, Active park Lipno, Camping Lipno Modřín or in printed information materials issued by the hire shop keeper for the purpose specified above and distributed to third parties. A list of information materials in which the Record can be published is available in the marketing department of Lipno Servis s.r.o. In case of a consumer dispute arising out of a purchase contract/services provision contract between a provider/seller/operator and consumer, which dispute cannot be settled by means of a mutual agreement, the consumer can file a motion of extrajudicial settlement of such a dispute to the appropriate body of extrajudicial settlement of consumer disputes, which is Czech Trade Inspection Authority, Central Inspectorate – ADR Department Štěpánská 15, 1200 Prague 2, Email: adr@coi.cz Web: adr.coi.cz. A consumer can use the platform for online settlement of disputes, which is established by the European Commission at http://ec.europa.eu/consumers/odr/.